A mysterious cult worships something called “the Vortex” in a temple like nothing anyone in the Ninth World has ever seen. PCs explore the strange complex to find a missing boy, and become embroiled in multiple scenarios, one of which might just take them unimaginably far from home! This 18-page adventure was the GenCon 2013 Numenera “launch” scenario, presented in two parts, and is ideal to use as an introduction to the game, a stand-alone scenario, or as part of an ongoing campaign. Also included are six pre-generated characters, so you have everything you need to play! Note: The total page count of 30 pages includes the 18-page adventure, plus 6 double-sided pre-generated characters. 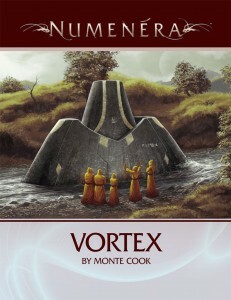 You can purchase a PDF of Vortex at our online store and at DriveThruRPG.